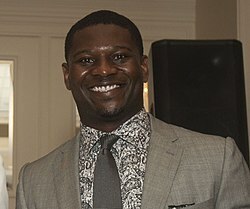 LaDainian Tramayne Tomlinson (born June 23, 1979) is a former professional American football player who was a running back in the National Football League (NFL) for eleven seasons. He is widely considered one of the greatest running backs of all time. He played the majority of his career with the San Diego Chargers, who selected him with the fifth overall pick in the 2001 NFL Draft. Tomlinson was invited to five Pro Bowls, was an All-Pro six times, and won consecutive rushing titles in 2006 and 2007. At the time of his retirement, he ranked fifth in career rushing yards (13,684), seventh in all-purpose yards (18,456), second in career rushing touchdowns (145), and third in total touchdowns (162). He currently serves as an analyst on NFL Network. After being elected to the College Football Hall of Fame in 2014, Tomlinson was inducted into the Pro Football Hall of Fame in August 2017, his first year of eligibility. Tomlinson played college football for Texas Christian University (TCU), earned consensus All-America honors, and won the Doak Walker Award as the best college running back. He spent nine seasons with the Chargers. During the 2006 NFL season, he set several NFL touchdown scoring records and received numerous honors and awards including the NFL's Most Valuable Player Award and the Associated Press's Offensive Player of the Year Award. In 2010, he signed as a free agent with the New York Jets, playing for two seasons before retiring after 2011. Tomlinson is often referred to by his initials, L.T. An effective passer on halfback option plays, Tomlinson threw seven touchdown passes and ranks second behind Walter Payton (8) for non-quarterbacks since the AFL–NFL merger in 1970. He was named to the NFL's 2000s All-Decade Team as one of the top running backs of the 2000s. Tomlinson was born to Loreane Chappelle and Oliver Tomlinson in Rosebud, Texas. His father left the family when Tomlinson was seven years old. Tomlinson did not see his father very often afterwards. His mother worked as a preacher. At age nine, Tomlinson joined the Pop Warner Little Scholars football program and scored a touchdown the first time he touched the ball. Tomlinson attended University High School in Waco, Texas, where he played basketball, baseball, football, and ran track. Tomlinson began his football career as a linebacker, but blossomed on the offensive side of the ball. Tomlinson amassed 2,554 yards and 39 touchdowns his senior year, earning honors as the District 25-4A Most Valuable Player, Super Centex Offensive Player of the Year. He was named in the state all-star football team in 1997, which included future San Diego teammates Drew Brees (Austin Westlake) and Quentin Jammer (Angleton). In track & field, Tomlinson competed as a sprinter and was a member of the Waco University 4 × 100 m (41.82s) relay squad. Tomlinson was an avid Dallas Cowboys and Miami Hurricanes fan during his youth. He idolized Walter Payton and admired Emmitt Smith, Jim Brown, and Barry Sanders. Tomlinson accepted an athletic scholarship at Texas Christian University in Fort Worth, Texas, then a member of the Western Athletic Conference (WAC). He played for the TCU Horned Frogs from 1997 to 2000. Prior to Tomlinson's arrival, TCU had appeared in only one bowl game in the previous 12 seasons (and two in the previous 34), and had recently been "downgraded" to a minor conference (the WAC) after the breakup of the Southwest Conference. During Tomlinson's freshman and sophomore years, he split time with Basil Mitchell. In the 1998 season he helped the Horned Frogs to their first bowl win in 41 years against the USC Trojans in the Sun Bowl. During his junior season in 1999, he set an NCAA FBS record for most rushing yards in a single game with 406 against UTEP; the record stood until 2014, when Wisconsin's Melvin Gordon rushed for 408 yards which was subsequently broken only one week later by Oklahoma's Samaje Perine after running for 427 yards against Kansas. Tomlinson finished his season with an NCAA-leading 1,850 yards rushing to go along with 18 touchdowns. In his senior season in 2000, Tomlinson led the NCAA for the second time with 2,158 yards and 22 touchdowns, and was recognized as a unanimous first-team All-American. He won the Doak Walker Award as the nation's best running back, and was a finalist for the 2000 Heisman Trophy, but came in fourth in the voting. He completed his college career with 5,263 rushing yards, ranking sixth in NCAA Division I history. The school retired his jersey (No. 5) during halftime of a November 2005 game against UNLV. In December of that year, Tomlinson fulfilled a promise to his mother by earning his degree in communications from TCU. He was inducted into the College Football Hall of Fame on December 9, 2014. The San Diego Chargers selected Tomlinson in the first round of the 2001 NFL Draft, as the fifth overall pick. The Chargers possessed the draft's first selection, but traded the pick to the Atlanta Falcons, who drafted Michael Vick. In this way, many consider that Vick and Tomlinson were "traded" for each other, although the transaction was actually the result of traded draft picks. In exchange for San Diego's first draft pick, with which Atlanta selected Vick, the Chargers received Atlanta's #5 pick (used to draft Tomlinson), Atlanta's third-round (67th overall) pick, which San Diego used to select Tay Cody, and Atlanta's second-round pick in 2002, which San Diego would use to select Reche Caldwell. San Diego also received Atlanta's wide receiver Tim Dwight. The Chargers' general manager, John Butler, made the deal contingent on San Diego receiving Dwight, to which Atlanta agreed. Tomlinson immediately became the starting running back with the Chargers. He achieved immediate success in the NFL, rushing for over 1,200 yards and making over 50 receptions in each of his first seven seasons. He also proved to be an effective passer, completing eight career passes, seven of them for touchdowns and maintaining a career passer rating of 154.4. Tomlinson ran for 1,236 yards on a 5–11 Chargers team in his rookie season. In 2003, he became the first player in NFL history to rush for 1,000 yards and record 100 receptions in the same season. He also reached his 50th career touchdown in his 4th season (60th game) and was elected to the Pro Bowl team in 2002, 2004, 2005, and 2006. Tomlinson also tied Lenny Moore's all-time record for consecutive games scoring a TD (18). 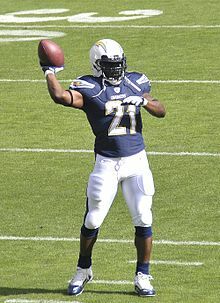 On October 16, 2005, in the Chargers' victory over the Oakland Raiders, LaDainian Tomlinson became the 7th player in NFL history to run, catch, and throw for a touchdown in the same game. Despite breaking his ribs towards the end of the 2005 season, LaDainian continued to play and finished the season with 1,462 rushing yards, 370 receiving yards, and a career-high 20 touchdowns (18 rushing, 2 receiving). In 2005, he was nominated for the FedEx Ground Player of the Year Award. Tomlinson placed third behind Tiki Barber and Shaun Alexander. In the 2006 season, he set NFL records by scoring 14 touchdowns in a span of 4 games, 16 touchdowns in span of 5 games, and 19 touchdowns in a span of 6 games, including a franchise record 4 touchdowns in games against the San Francisco 49ers, Cincinnati Bengals and the Denver Broncos. He is the first to score three TDs in three straight games and became the first to score at least 3 in four straight games set the following week. Also, he became the second to have three games of four or more TDs in one season (Marshall Faulk became the first back in 2000). He became the fastest player ever to score 100 touchdowns. On November 19, 2006, Tomlinson accomplished the milestone in 89 games with 102, beating the previous record of 93 games held by Jim Brown and Emmitt Smith. On December 3, 2006, Tomlinson became the first running back to rush for at least 1,236 yards in his first six NFL seasons (he has now done so in his first seven years as well). On December 7, he was named the AFC Offensive Player of the Month. He scored his 29th touchdown against the Denver Broncos in just 13 games (Alexander set the record in 16). His 2 touchdown passes do not count toward this record because the NFL treats them in a separate category. With the first touchdown against Kansas City on December 17, he surpassed the NFL record for most points in a season which had stood for 46 years. Tomlinson would finish his record-breaking season with 2,323 yards from scrimmage and 31 touchdowns (28 rushing, 3 receiving). San Diego finished with a franchise-best 14–2 record, scoring a league-leading 492 points. Tomlinson went on to rush for 123 yards, catch 2 passes for 64 yards, and score 2 touchdowns in the Chargers divisional playoff loss to the New England Patriots. After the game, the usually mild-mannered Tomlinson blamed Patriots head coach Bill Belichick for some New England players celebrating on the Chargers midfield logo at Qualcomm Stadium by mocking Charger Shawne Merriman's sack dance. "They showed no class at all. Absolutely no class. And maybe that comes from the head coach," said Tomlinson. On January 5, 2007, Tomlinson was awarded with the NFL Most Valuable Player Award for his record-breaking season. He was the runaway winner, receiving 44 of the 50 votes from a panel of nationwide sportswriters and broadcasters who cover the NFL. Former teammate Drew Brees, now a New Orleans Saint, received four votes and Indianapolis quarterback Peyton Manning received two votes. 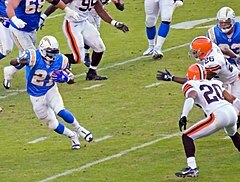 Additionally, Tomlinson was one of nine Chargers players selected for the 2007 Pro Bowl and was a starting running back for the American Football Conference. He was also recognized by the Associated Press as they awarded him their Offensive Player of the Year Award. He was later named co-holder of the Walter Payton Man of the Year Award alongside his aforementioned former teammate Drew Brees. On July 11, 2007, Tomlinson won the ESPY Awards for Male Athlete of the Year, Best Record-Breaking Performance and Best NFL Athlete, as well as the Hummer Like Nothing Else Award. Norv Turner, who was the San Diego Chargers offensive coordinator in Tomlinson's rookie season, replaced Marty Schottenheimer as San Diego Chargers head coach in 2007. "Norv is the perfect fit for our team. He will know exactly what to do with our team," Tomlinson said of the hiring. On December 2, 2007 Tomlinson passed Walter Payton on the all-time rushing touchdown list, with his 111th career rushing touchdown, against the Kansas City Chiefs. A day later, Tomlinson honored Payton by wearing his jersey during a press conference. Tomlinson led the league in rushing with a total of 1,474 rushing yards in 2007, becoming the first player since Edgerrin James in 2000, to win back-to-back rushing titles. During the year, Tomlinson became the fourth fastest player to reach 10,000 rushing yards in NFL history. Tomlinson ran for 42 yards on 21 carries and caught 3 passes for 19 yards, and scored a touchdown in the San Diego Chargers wild-card playoff victory over the Tennessee Titans on January 6, 2008. He scored his touchdown on fourth and goal, leaping over the pile and reaching across the goal line to help secure the fourth-quarter lead for the Chargers. Tomlinson sprained the medial collateral ligament (MCL) in his left knee and missed the second half of the Chargers divisional playoff win over the Indianapolis Colts on January 13, 2008. Tomlinson attempted to play through the injury, and had two carries for 5 yards before sitting out the rest of the 2008 AFC Championship. The Chargers lost to the New England Patriots, 21–12. A lasting image from the game is Tomlinson sitting on the Chargers bench, and his helmet with a dark visor still over his head. Some San Diego Chargers fans and media—including Deion Sanders—questioned Tomlinson's toughness. Retired NFL great Jim Brown said Tomlinson "looks so comfortable sitting there ... And then you have his quarterback out there giving everything he had, and it was a contrast between the two visually that when you looked at him and you looked at Philip Rivers, you said well, damn—we don't know how bad Tomlinson was hurt." Terrell Davis, whose NFL career ended due to knee injuries, said, "... when you're talking about the knee, it just ain't the same." Tomlinson did not participate in the San Diego Chargers' off-season program in 2008 because of the injury. Much like the previous year, Tomlinson got off to a slow start after jamming his big toe against the Carolina Panthers in the second week into the season. Tomlinson did not record a 100-yard rushing performance until week four against the Oakland Raiders while having averaged 3.3 yards per carry the first three weeks. Tomlinson averaged 17 carries per game up to mid-season and had had four rushing touchdown and one receiving touchdown. Though Tomlinson had two 100-yard rushing performances on the season, he topped the 1,000-yard rushing mark for the 8th consecutive time in his career which placed him third all-time alongside Thurman Thomas for consecutive 1,000-yard rushing seasons behind Curtis Martin, Barry Sanders and Emmitt Smith. He ended the season with a career-low 1,110 rushing yards on a career-low 292 attempts and 11 touchdowns thanks to a three-touchdown performance in the final game of the 2008 season. He also moved up the all-time list of touchdowns, getting his 126th rushing touchdown, which passed Marcus Allen's 123 and his 141st touchdown moved him closer to Marcus Allen's 145 total touchdowns in a career which is tied for third all-time with wide receiver Terrell Owens, behind Emmitt Smith (175) and Jerry Rice (208). He also became the fifth player in NFL history to have 500 receptions and rush for more than 10,000 yards. Tomlinson partially tore his groin in the finale against Denver. He played the first half in the wild-card round against the Colts before re-injuring the groin and missing the Chargers' divisional loss to the Pittsburgh Steelers. That's the class that he shows ... I wanted to come down here and show mine ... I'm happy that he did it. It makes it special, because he's a good human being. He's a class individual, and I hope in these later years y'all treat him that way. —Jim Brown, after witnessing Tomlinson passing him as the eighth leading rusher in NFL history on December 6, 2009. After a contentious off-season negotiation, Tomlinson and the Chargers came to an agreement on March 10, 2009, to restructure his three-year contract so that he could remain a Charger. Tomlinson suffered an ankle injury on opening day of the 2009 season against Oakland and missed the next two games. The offensive line was impacted by injuries during the season, and Tomlinson's production declined with career lows in rushing attempts (223) and yards (730). He scored 12 touchdowns, but his yards per carry was a 3.3 average. The Chargers were last in the league in yards per carry, also averaging 3.3. The Chargers finished with a 13–3 record, winning 11 in a row, without a strong running game. They were upset in the second round by the wild-card New York Jets. Tomlinson was named to the NFL's 2000s All-Decade Team after leading the league with 12,490 rushing yards in the 2000s, 1,897 more than runner-up Edgerrin James. His 138 rushing touchdowns during the decade set an NFL record for any decade, and were 38 more than any other player in the 2000s. After much speculation about Tomlinson's future with the team, the Chargers released Tomlinson on February 22, 2010, after nine seasons with the team. Many experts attributed his decline to his age (30) and injuries. In his farewell news conference, Tomlinson said his production declined after the 2006 season when Schottenheimer departed. He felt that the team's focus on running dropped under Turner; he later referred to Turner as a "passing coach". The San Diego Union-Tribune, in an article titled "No doubt: Norv wants to run ball", wrote that Tomlinson enjoyed success in his rookie season with Turner as offensive coordinator, as well as in Turner's first season as San Diego's head coach in 2007. The article also cited Turner's history of coaching 1,000-yard rushers, including Emmitt Smith's three NFL rushing titles. Tomlinson lamented the team's release of fullback Lorenzo Neal after 2007, but Neal was not a starter the next season with Baltimore. Tomlinson left the Chargers ranked eighth among NFL career rushing leaders with 12,490 yards. He also ranked second with 138 career rushing touchdowns, and third with 153 total touchdowns. He became the fastest player to reach 150 career touchdowns (137 games). Tomlinson expressed a desire to eventually retire as a San Diego Charger, but acknowledged a difficult relationship with Chargers general manager A. J. Smith. He said he "felt disrespected" by comments Smith made in the past. McClatchy Newspapers wrote in 2011 that Tomlinson was likely to have his number 21 retired by the Chargers once he retires. Bob Wick, the San Diego Chargers equipment manager, said he tried to keep No. 21 out of circulation, even though it had not been officially retired. Tomlinson in 2011 with the Jets. For the first time in his career, Tomlinson entered the free-agent market, with many teams expressing interest. Despite the fact that Tomlinson still believed that he was a number one caliber running back, he would be forced to split time with another running back and after various contract negotiations, Tomlinson signed a two-year, $5.2 million contract with the New York Jets on March 14, 2010. Tomlinson chose to sign with New York because he felt more comfortable with the team's philosophy and personnel, and he felt that the team offered him the best chance to win a championship. Tomlinson recorded his first 100-yard rushing game in nearly two years on October 3, 2010 against the Buffalo Bills. In the game, Tomlinson also passed Tony Dorsett for 7th on the all-time rushing list. On October 31, 2010, Tomlinson reached another career milestone joining Walter Payton as the only players in NFL history to gain 13,000 yards rushing and 4,000 yards receiving. On December 6, 2010, against the New England Patriots on Monday Night Football, LaDainian Tomlinson passed Eric Dickerson for 6th on the all-time rushing list. On December 19, 2010, LaDainian Tomlinson reached another milestone by passing Marcus Allen for 6th on the all time yards from scrimmage list. He finished the season leading the Jets in rushing with 914 yards, though it was widely thought he would be a complement to Shonn Greene, whom he outrushed by 148 yards. It was also Tomlinson's first year in his entire career that he did not record double-digit TDs, as he recorded a career low of 6. He rushed for 82 yards on 16 attempts and ran for both Jets touchdowns in a 17–16 victory over the Colts in the AFC wild card playoffs. Against the Patriots in the AFC Divisional playoffs, the Jets won 28–21 as Tomlinson rushed for 49 yards on 10 attempts and caught a touchdown. It was his 7th career postseason touchdown. In the AFC Championship Game against the Steelers, the Jets were down 24–10 in the fourth quarter when Tomlinson was unable to score a touchdown on a fourth-and-goal from the one-yard line. The Jets went on to lose 24–19. Tomlinson had nine carries for 16 yards. Jets general manager Mike Tannenbaum said after the season that he expected Tomlinson back for 2011 but "things could change." With Greene designated as the starting running back for 2011, Tomlinson began the season as a third-down back and caught six passes for 73 yards in the season opener. On September 25, 2011, against the Oakland Raiders Tomlinson caught an 18-yard touchdown pass for his 160th career touchdown, joining Emmitt Smith and Jerry Rice as the only players to score 160 career touchdowns. On October 9, 2011, against the New England Patriots Tomlinson became the 6th player in NFL history to reach 18,000 yards from scrimmage. On October 23, 2011 against the San Diego Chargers Tomlinson became the 4th running back in NFL history to have 600 career receptions, joining Larry Centers, Marshall Faulk, and Keith Byars. On November 13, 2011 against the New England Patriots Tomlinson passed Barry Sanders for 5th on the all time yards from scrimmage list. On December 18, 2011 against the Philadelphia Eagles Tomlinson passed Keith Byars for 3rd on the all-time career receptions list for running backs. On January 1, 2012 against the Miami Dolphins Tomlinson passed Jerome Bettis for 5th on the all-time rushing yards list. On June 18, 2012, Tomlinson signed a ceremonial contract with the San Diego Chargers and then immediately announced his retirement. Chargers president Dean Spanos said that no other Charger would ever wear Tomlinson's No. 21. At the time of his retirement, Tomlinson ranked fifth in NFL history in career rushing yards (13,684), second in career rushing touchdowns (145), and third in career total touchdowns (162). The Chargers formally retired his number in 2015. Tomlinson was inducted into the Pro Football Hall of Fame in 2017. Tomlinson threw for seven touchdowns in his career. Most single season touchdowns (31 in 2006; previously 28 in 2005 by Shaun Alexander). Most games with 2+ rushing touchdowns (38). Most seasons with 11+ rushing touchdowns (8) 2002–2009 – tied with Emmitt Smith 1990–1996, 1998–1999. Tomlinson being tackled by Jeremiah Trotter at the 2006 Pro Bowl. He is a Christian. Tomlinson was introduced to his future wife, LaTorsha Oakley, while the two were students at TCU. The couple married on March 21, 2003. Tomlinson's son, Daylen, was born on July 8, 2010. In 2011, Tomlinson's daughter was born, before driving to their season opener. In 2007, LaDainian's father Oliver Tomlinson and brother-in-law Ronald McClain died in an auto accident. Tomlinson, who had a "great relationship" with his father, was devastated by the tragedy. Tomlinson has been featured in several commercials for Nike, Campbell Soup and Vizio. As late as 2005, he was wearing Nike Zoom Air football cleats (size 13½). In April 2007, Tomlinson turned down a request to become the cover athlete and official spokesman for EA Sports' Madden NFL 08 video game. Tennessee Titans quarterback Vince Young was eventually selected for the cover. In August 2012, Tomlinson joined the cast of NFL Network's Sunday morning show "First on the Field" as an analyst. In 2013, he also became the host and judge to determine the "Top 5 Running backs" of each week. In 2016, Tomlinson was cast in the feature film God Bless the Broken Road, based on the song of the same name. While originally announced for a 2016 release, as of June 2018 it has yet to find a distributor and has not been released. Tomlinson wrote the foreword for Chris Tomlinson's book, Tomlinson Hill, which traces the story of two families—one white and one black—from a plantation in Tomlinson Hill, Texas. The plantation was owned by Chris' great-great-grandparents, while LaDainian descended from a slave owned by Chris' ancestors. The San Diego Chargers retired Tomlinson's jersey and number during a halftime ceremony on November 22, 2015. Tomlinson joined Lance Alworth, Dan Fouts and the late Junior Seau in that honor. Tomlinson also had his number raised to the rafters at Qualcomm Stadium, becoming the 38th member of the Chargers' Hall of Fame, and had his name placed in the team's Ring of Honor. ^ Edholm, Eric (June 15, 2012). "L.T. did it all except win it all". ProFootballWeekly. Archived from the original on July 22, 2013. Retrieved July 21, 2013. ^ Tomlinson, LaDainian (May 22, 2013). "LT goes one-on-one with Bengals QB Andy Dalton". Fox Sports Southwest. Archived from the original on July 22, 2013. Retrieved July 21, 2013. ^ Dudley, John (November 2, 2005). "The throwback running back". coldhardfootballfacts.com. Archived from the original on November 13, 2012. ^ "Football All-Stars" (PDF). Texas High School Coaches Association. ^ "Melvin Gordon sets FBS rushing record with 408 yards vs. Huskers". Associated Press. November 15, 2014. Retrieved November 15, 2014. ^ "Oklahoma's Samaje Perine breaks FBS rushing record with 427 yards". Retrieved January 23, 2016. ^ Our All-Time Numbers Archived December 11, 2006, at the Wayback Machine from TCU Magazine, obtained December 18, 2006. ^ McMurphy, Brett (May 22, 2014). "College Football HOF reveals class". ESPN.com. Archived from the original on May 22, 2014. ^ Mihoces, Gary (July 12, 2006). "Tomlinson plying his trade well". USA Today. ^ Canepa, Nick (July 18, 2007). "Tiny Tim saved Bolts from Vick". UNION-TRIBUNE. ^ Ladainian Tomlinson Stats from NFL.com. ^ a b c d e Canepa, Nick (May 23, 2010). "No doubt: Norv wants to run ball". The San Diego Union-Tribune. Archived from the original on May 16, 2012. ^ LT Named AFC Offensive Player of the Month Archived December 11, 2006, at the Wayback Machine obtained December 17, 2006. ^ Win yields title, date with history Archived January 1, 2007, at the Wayback Machine obtained December 17, 2006. ^ a b c d Acee, Kevin (December 18, 2006). "Follow the leader". The San Diego Union-Tribune. Archived from the original on March 3, 2011. ^ a b Byrne, Kerry J. (June 3, 2009). "Best individual seasons of 2000s". SI.com. Archived from the original on May 17, 2012. ^ Smith, Michael David (January 15, 2007). "Late Mistakes Wipe Out Tomlinson's Stellar Play". The New York Sun. Retrieved May 17, 2012. He was upset that some Patriots were dancing on the Chargers logo at midfield after taking the lead. ^ "Patriots look to avoid Chargers' jolt". Cape Cod Times. Associated Press. October 12, 2008. Archived from the original on May 17, 2012. ^ Wilner, Barry (January 5, 2007). "L.T. Wins AP Offensive Player Award". The Washington Post. Associated Press. Retrieved February 2, 2017. ^ a b Canepa, Nick (April 9, 2010). "LT should bite his lip, not hand that fed him". The San Diego Union-Tribune. Archived from the original on May 16, 2012. ^ a b c d "L.T. sees chance to redeem himself in New England". ESPN.com. Associated Press. January 13, 2011. Archived from the original on May 16, 2012. ^ Acee, Kevin (January 31, 2008). "MRI shows Tomlinson damaged knee further vs. Pats". The San Diego Union-Tribune. Archived from the original on May 17, 2012. ^ Mortensen, Chris. "Second-degree MCL sprain to sideline LT six weeks". ESPN.com. Archived from the original on May 17, 2012. ^ a b Posner, Jay (January 25, 2008). "Time to tune out the LT static". The San Diego Union-Tribune. Archived from the original on May 17, 2012. ^ Wilson, Bernie (November 30, 2008). "Ryan, Turner lead Falcons past Chargers". The San Diego Union-Tribune. Associated Press. Archived from the original on February 15, 2013. ^ a b Sullivan, Tim (April 24, 2010). "Read between lines to see Bolts' message to LT". The San Diego Union-Tribune. Archived from the original on May 16, 2012. ^ Acee, Kevin (April 3, 2010). "Chargers react to LT's jabs at his former team". The San Diego Union-Tribune. Archived from the original on May 16, 2012. ^ Pearce, Casey (February 1, 2010). "Three Chargers named to All-Decade team". Chargers.com. Archived from the original on February 15, 2013. ^ Wood, Skip (January 28, 2010). "'Gifted' LaDainian Tomlinson blazed new NFL trail in 2000s". USA Today. Archived from the original on February 15, 2013. ^ a b Jenkins, Chris (February 25, 2010). "Tears shed as No. 21 says his goodbyes". The San Diego Union-Tribune. Archived from the original on May 16, 2012. ^ Sullivan, Tim (April 26, 2010). "LT trades pigskin for olive branch". The San Diego Union-Tribune. Archived from the original on May 16, 2012. ^ Williams, Charean (January 23, 2011). "Tomlinson's best title shot". The Charlotte Observer. Archived from the original on May 14, 2012. Retrieved May 13, 2012. ^ Sullivan, Tim (March 4, 2010). "Retiring a number can be tricky math problem". The San Diego Union Tribune. Archived from the original on May 13, 2012. ^ Canepa, Nick (May 13, 2012). "Chargers have several more numbers they should retire". U-T San Diego. Archived from the original on May 14, 2012. ^ Sullivan, Tim. "'55' remains prime number for Seau". U-T San Diego. Archived from the original on May 13, 2012. ^ Caldwell, Dave (January 6, 2011). "Rested Against Bills, Tomlinson Is Set for Colts". The New York Times. p. B16. Retrieved January 27, 2011. After last season, in which he rushed for a career-low 730 yards for San Diego, Tomlinson signed a two-year contract with the Jets, but it was widely thought he would be a complement to Shonn Greene. Tomlinson outrushed Greene by 148 yards. ^ Bishop, Greg (January 10, 2011). "Slowly and Steadily, the Jets Move Straight Ahead". The New York Times. p. D4. Retrieved January 27, 2011. Both drives ended the same way, with Tomlinson bounding into the end zone from a yard out. ^ "Mark Sanchez tosses 3 TDs as Jets soar into AFC title game". ESPN.com. Associated Press. January 16, 2011. Retrieved January 27, 2011. LaDainian Tomlinson: 7th career postseason TD, most among all active running backs. ^ Bishop, Greg (January 25, 2011). "Out and Onward: Moments That Made the Game". The New York Times. p. B13. Retrieved January 27, 2011. But instead of Greene, they sent running back LaDainian Tomlinson into a wall of black and gold. When Tomlinson tried to extend the ball over a crush of Steelers, he could not lift it. ^ "New York Jets vs. Pittsburgh Steelers - Box Score - January 23, 2011 - ESPN". ESPN.com. January 23, 2011. Retrieved January 27, 2011. ^ Cimini, Rich (March 1, 2011). "Sources: LaDainian Tomlinson to return". ESPNNewYork.com. Retrieved March 1, 2011. General manager Mike Tannenbaum said after the season that he expects Tomlinson back but left some wiggle room by saying "things could change." Tomlinson's late-season fade, coupled with McKnight's strong showing in the Jets' regular-season finale, prompted some to speculate that the team was mulling a change. ^ Waszak Jr., Dennis (September 15, 2011). "Jets' Tomlinson remakes himself as 3rd-down threat". Yahoo! Sports. Associated Press. Archived from the original on September 16, 2011. ^ Armstrong, Kevin (September 26, 2011). "LaDainian Tomlinson joins Emmitt Smith, Jerry Rice as only NFL players with 160 career touchdowns". New York Daily News. Archived from the original on September 26, 2011. Retrieved September 26, 2011. ^ "LaDainian Tomlinson to retire". Espn.com. ^ Wilson, Bernie (June 18, 2012). "Tomlinson signs 1-day contract with Bolts, retires". U-T San Diego. Associated Press. Archived from the original on May 21, 2013. ^ a b c Gehlken, Michael (June 17, 2012). "LT's legacy rich in records". U-T San Diego. Archived from the original on June 26, 2012. ^ Gehlken, Michael (June 10, 2015). "Chargers to honor LaDainian Tomlinson". The San Diego Union-Tribune. Archived from the original on June 14, 2015. ^ "LaDainian Tomlinson, Hines Ward among 94 nominated for Hall". ^ a b c d e f g h "San Diego Chargers Media Guide 2009" (PDF). San Diego Chargers. 2009. p. 122. Archived (PDF) from the original on June 4, 2013. ^ a b c "LT retires as Charger following Hall of Fame career" (Press release). San Diego Chargers. June 18, 2012. Archived from the original on June 4, 2013. ^ Zimmerman, Lisa (October 18, 2010). "Their record says they're the best". TheJetsBlog.com. SNY. Archived from the original on October 20, 2010. Retrieved October 20, 2010. ^ "LaDainian Tomlinson Stats - Pro-Football-Reference.com". Pro-Football-Reference.com. ^ "Ladainian Tomlinson Game-Worn, Signed Cleats & Gloves, Four Signatures". Archived from the original on August 22, 2009. ^ "LT turned down Madden game cover". ^ a b Busch, Anita (May 16, 2016). "Kim Delaney, Jordin Sparks Join 'God Bless The Broken Road'". Deadline Hollywood. Retrieved June 19, 2018. ^ Bond, Paul (January 3, 2017). "NFL Great LaDainian Tomlinson to Star in Movie Based on Country Song". The Hollywood Reporter. Retrieved June 19, 2018. ^ "On 'Tomlinson Hill,' Journalist Seeks Truth And Reconciliation". NPR.org. July 21, 2014. Archived from the original on July 21, 2014. ^ NFL. "Chargers to retire LaDainian Tomlinson's No. 21 jersey". www.ESPN.com. ESPN. Retrieved June 10, 2015. 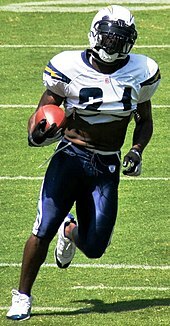 Wikimedia Commons has media related to LaDainian Tomlinson. "LaDainian Tomlinson Career Highlights". NFL.com. March 9, 2015 – via YouTube.